We have been undertaking primary clearing of woody weeds (primarily Lantana camara, Ligustrum lucidem, Cestrum parquii and Ligustrum sinense) and treatment of vines such as Lonicera japonica, Anredera cordifolia, Acetosa sagittata and Cardiospermum grandiflorum. We focused on completing primary works in the early months of winter to minimise the disturbance of local fauna who would use the thickets of woody weeds to nest or roost in in Spring/Summer. We have raked back sections of Tradescantia fluminensis and flame weeded the ground along sections of Smalls Creek to try and stimulate native regeneration. We have been conducting maintenance works throughout the project site, beginning from areas of good bush moving to areas of lower resilience. Whilst our priority treatment has been on noxious weeds, we have also managed to treat environmental weeds and vines as well as conducting aquatic weed management throughout the whole site. We have also monitored the amount of debris accumulating along the creek line and removed it as required. The site is progressing very well as recent works have significantly reduced woody weeds and improved the overall flow of the creek line. The targeted removal of Erythrina crista-galli throughout the creek has been conducted. Canopy has also been lifted to limit the amount of debris caught up and brushcutting of reeds on the upper banks should allow for a better flow of water and reduced nutrient levels on the banks, limiting weed growth. Future works will involve treatment of emerging vines throughout the site and the removal of sediment and rubbish (trolleys) at the northern end of the site will improve the water flow and quality. We have focused on reducing herbaceous weed levels and doing staged, primary treatment of woody weeds. We have been undertaking aquatic weed control, herbaceous weed treatment as well as focused control of Asparagus asparagoides and Bryophyllum delagoense around all the planting beds as well as around the endangered Acacia pubescens. We have been manually removing herbaceous annuals and grasses throughout the site and spot sprayed young, herbaceous annuals with a selective herbicide. We monitor the site for any new weed incursions and the fence line for any structural issues. We have been transplanting Commelina cyanea will be conducted into the lower slopes of the naturalised area to encourage a dense native groundcover. We have been maintaining the sections of Saltmarsh via careful manual removal of herbaceous species and Cynodon dactylon and monitoring the growth of mangroves and advising the client when they are suitable to be removed. We have focused our efforts on undertaking bush regeneration through the riparian zone of this site. We will be revegetating sections with low resilience with provenance species in late Autumn, 2018. Works have targeted the aquatic weeds Salvinia molesta and Ludwigia peruviana as well as undertaking aquatic weed control throughout the whole site. We have ensured the outlet and inlet channel can flow freely and that the gross pollution trap (GPT) can be accessed. 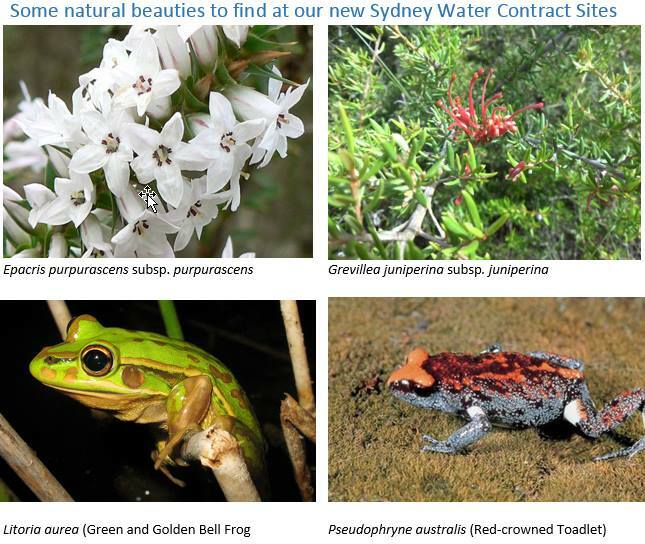 Maintenance works have been targeting herbaceous species throughout the zone on the eastern side of the creek. Regular monitoring will be conducted for any aquatic weeds that are then treated appropriately. And we are hoping to undertake gradual revegetation of the site in stages with appropriate plants from the ecological communities on-site. There has been a lot of hard work behind the scenes and we are very grateful to all those involved in making this happen. A big shout-out to Julianne Noble and Jake Proust our Site Supervisors, and Adrian Visintin our Project Liaison Officer as well as our Leading Hand David Chorobski and our awesome Natural Area Specialists – Erin, Roger, Deni, Jean, and Kyran. We are so happy that we have such a passionate and dedicated team that are working hard, efficiently and have fun together to produce great work!